This is our beloved Hunter. My husband Jay and I rescued him in November of 2012. He was 4 yrs old at the time and had never known a 'furever' home. He was a hard placement because of behavioral issues from never being socialized with people and extensive medical problems that meant keeping him on very expensive medications. 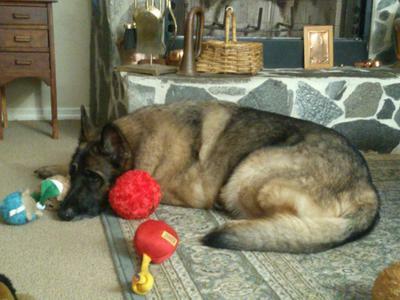 He spent a year at a rescue in a pen that could barely hold a beagle let alone a 120lb GSD! He couldn't turn around, just walk forward and backward. This resulted in a spinal fusion, perpetual weakness in his hind legs and broken teeth from constantly chewing through the chain link fencing around his pen. Thankfully he was taken into foster care by a kind woman and her husband who worked hard to find him the perfect home. I had always wanted a GSD. As a kid I would rush home from school to watch grainy black and white reruns of Rin Tin Tin and dream about having such a beautiful dog for my best friend. It only took about 30 years to find him! Good things really do come to those who wait! Bless your heart for the lovely investment you have made in this sad young mans life. He will always be your best friend and the fact that you took him on, despite all his failings, that really shows what kind of person you are! Congratulations on your new buddy! I wish you both nothing but the best and if you have the chance in the future, maybe you can send us some more updates on how Hunter is doing. God bless you both!! Better late than never. Congtatulations on you boy, Hunter. German Shepherds are Amazing! They Loyal, Trustworthy and Protector. Take care of your boy and he will take care of you! Oh my gosh, Hunter is SO gorgeous! THis picture makes me want to lay down next to him and run my fingers through his beautiful coat!! God bless you for taking Hunter in and loving him so much!!! He must be the happiest boy on earth!!!!!!!!!!!!!! Peace and happiness to you and yours!